Visit our online store and see all of our beautiful designs available. Leora Raikin is on the teaching faculty for Road to California 2017. Read about Leora teaching Kids in the Daily News! 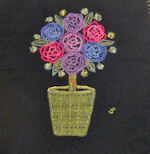 African Folklore Embroidery needlecraft kits are creative, fun and colorful. They are for the beginner as well as the sophisticated stitcher. All of the kits can be converted into pillows, purses, quilts and wall-hangings. 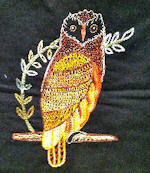 African Folklore Embroidery is a multi cultural needlecraft, a wearable art and a visual art that appeals to all ages. 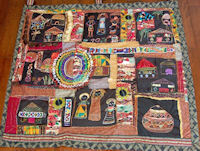 African Folklore Embroidery is quickly growing to become one of the most popular cultural and artistic classes available. The extreme contrasts of brightly colored threads against the black fabric make any completed design both striking and beautiful. African Folklore Embroidery is for quilters, those who love to quilt, embroider, hand appliqué, knit and crochet. 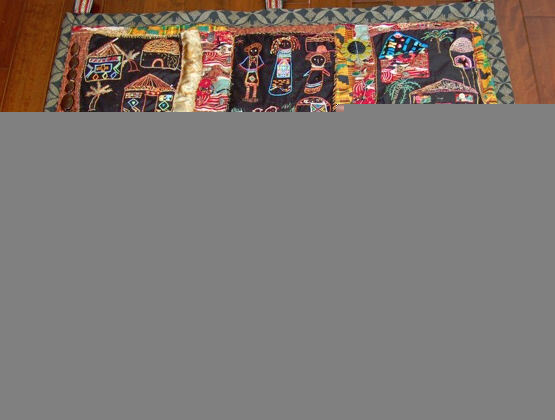 The book Safari through African Folklore Embroidery will be a good addition to your existing supply of quilting books. Our embroidery designs can be used as part of your quilt pattern and are ideal for incorporating into crazy quilting or patchwork quilting you can incorporate your quilt fabric into our design or around them. The embroidery designs will look magnificent in quilts. If you have beads and enjoy bead art, this is perfect for including beads and making completed designs into bead art or African Art. African Folklore Embroidery is owned by Leora Raikin, a South African native, living in Los Angeles. She was taught this creative and multi cultural needlecraft by her mother. "African Folklore Embroidery is my hobby and passion," says Leora. "I love stitching, I love using colors and I take a great sense of pride in each design completed by one of my students. No two completed kit designs ever look the same!" Leora has lectured over 6000 children and adults across the United States in the art of African Folklore Embroidery. These lectures are fun, interactive, humorous and informative. Check Leora's Schedule and meet her at one of the Shows or attend one of her many lectures. Quilters enjoy African Folklore Embroidery as it allows them to use up some of their fabric stash (and we all have a stash) through fabric fiber fusion and quilting. Those who love hand work , embroidery needlework ,needlepoint and needle arts, enjoy using their favorite embroidery stitches and embroidery threads in African Folklore Embroidery. Some people compare African Folklore Embroidery to crewel embroidery others surface embroidery or embroidery quilting, African Folklore Embroidery is these and more, incorporating as many or as few of the traditional embroidery stitches as you wish. Since the embroidery kit designs are pre-drawn they lend themselves to hand-appliqué. African Folklore Embroidery is a distributor of House Of Embroidery hand dyed variegated threads and African Folklore Embroidery creative and educational needlecraft kits. Please take a look at the wide variety of kits available at our online store. Also, check our Links Page for a store near you that sells and teaches African Folklore Embroidery.